It is white in color, with black and red touches of color here and there, for aesthetics. The DBPOWER X400 drone is not only the best FPV drone for kids, but it is also considered as the best drone for people who want to cut their teeth in drone piloting so that they can upgrade to a more advanced one later on. 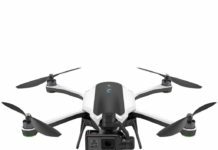 Unlike many other beginner cheap drones, this one has a camera, and a high quality one too. Besides, it also packs a good number of features, some of which are only found in the big, advanced drones. The price is so affordable even for a fun drone for kids. 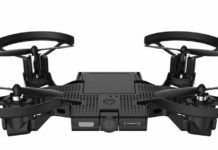 Tell you what, whether you are a beginner or an advanced drone user, this is a good device to have in your collection. The body of the drone is made of plastic, not to worry though as many drones are made of plastic. It measures about 11.8 by 11.8 inches with a 3-inch height. Weighing about 0.55 lbs, you do not need to register with the FAA to fly this drone. Note however that this is too light in weight, thus the drone would do quite poorly in windy conditions. The flight time of this drone is not too bad either, at 8 to 9 minutes. However, you can make it even longer by buying a spare battery. To charge fully, the battery takes about 100 minutes. The range of transmission for the transmitter is about 330 feet/100 meters. That is quite good for a beginner drone like this one. This drone is made of white plastic. It also feels a bit too plasticky in your hands. However, this does not affect its flight performance in any way as long as you fly it in calm weather. Spare parts are readily available in the online marketplaces, so it should be easy to buy them. Besides, it is sold with a spare set of rotors. One of the most important features for this drone is the first person view (FPV) which allows you to live-stream video feed as if you are inside the drone. To enjoy the real-time streaming you should download the MJX H app into your android or iPhone smartphone. This is a small app, integrates seamlessly with your device and only consumes minimal resources. The 720P camera is built-in so it is not removable. It is able to capture high quality photos and videos when on the air, thanks to the 6-axis gyro axis, which ensures stability. You can watch your footage on your smartphone or download to your desktop to watch later. This cheap drone also has headless mode. Would you believe that for a drone that sells for far less than 100 bucks? Drones usually fly in the direction that the nose is facing. However, with headless mode engaged, the drone flies in the direction of the controller. That means it can fly sideways as well as ahead. Wherever the transmitter will be, that is where the drone will fly. It has been designed with a 6-axis gyro axis for stability in the air. This means that the videos you shoot while the drone is in flight will be clear and of high quality too. You can even perform a 3D roll using just one button. Even beginners will find this feat very simple to accomplish. For safety, this drone for beginners has been equipped with the one key return home feature. Just press the return home button and the drone will turn back in the direction of the transmitter. For night flights, the drone has LED lights. You can be able to see its flight progress. 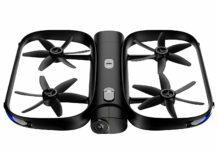 The drone controller is light in weight, looks a ruggedly-beautiful and it has a smartphone stand so that you can have a real-time view of what the drone is seeing. Joysticks and buttons are very responsive. However, learn how to use them because people have reported cases of their drones flying out of range fast. The controller uses 4 AAA batteries. 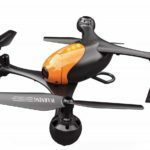 There are many other features, but mostly, this a fun drone and so you should sit back and relax as you fly it around. I bought this drone to teach myself how to fly one and then upgrade to a more advanced one for shooting videos and pictures. However, I lost my first drone when I flew it in the wind. It kept on flying even after I tried to run after it. A week later, I ordered another one, I still have it and I love it. Mercedes M.
Who Should Buy DBPOWER X400W? 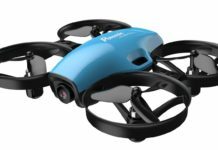 This is a good drone for kids, beginners and seniors who are looking for a drone that can just fly without issues. 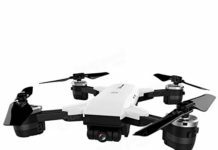 However, even advanced drone enthusiasts will love it because despite the low price, it has been designed with some advanced features. Besides, the price is quite affordable, not something that you would have to think too much about. But even for the best drone for beginners, if this is your very first drone, learn how to walk before you can run – study the user manual first. 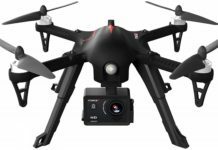 With the incredible price of less than $100, the advanced features such as headless mode that you mostly find on the big boy drones, a good 2MP 720P HD camera and return to home feature, this is a good investment. 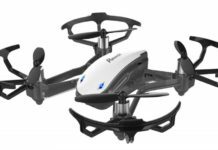 It is one of those drones that you buy because of the low price without expecting much, but the performance blows you away completely. 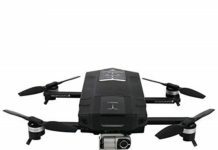 To buy or not to buy the DBPOWER X400 drone for beginners? To buy!